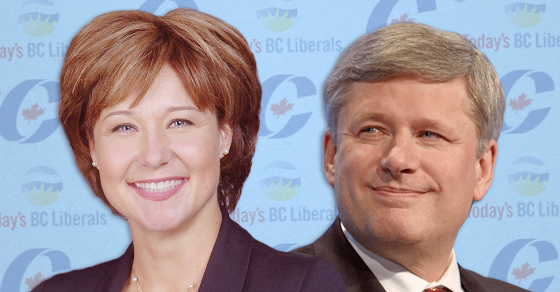 Why does Christy Clark call herself a Liberal when so many people working for her behind the scenes are literally Conservatives? It’s true that after Stephen Harper’s Conservatives were defeated in 2015, a lot of out-of-work Conservative staffers moved to BC to start working for Clark’s BC Liberals – how odd, guess a fundamental difference in values between Clark’s Liberals and Harper’s Conservatives wasn’t an issue for either side? But the revolving door between people working behind the scenes in Clark’s Premier’s office and Stephen Harper’s PMO is much deeper and goes back much, much further. 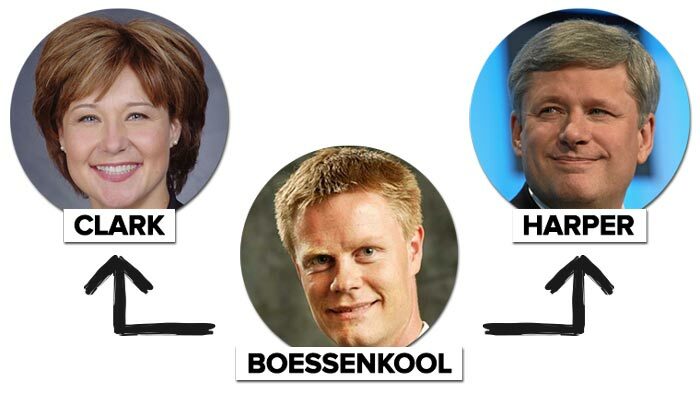 After resigning as Clark’s Chief of Staff in 2012, Boesenkool returned to Ottawa to play a key role in Stephen Harper’s war room during the 2015 election. According to Christy Clark, Harper’s former Transport Minister Chuck Strahl quietly worked for two years as an advisor to BC’s Premier. Today, the old Reform MP serves as a director for the Manning Centre, a conservative think tank named after former Reform Party leader Preston Manning. 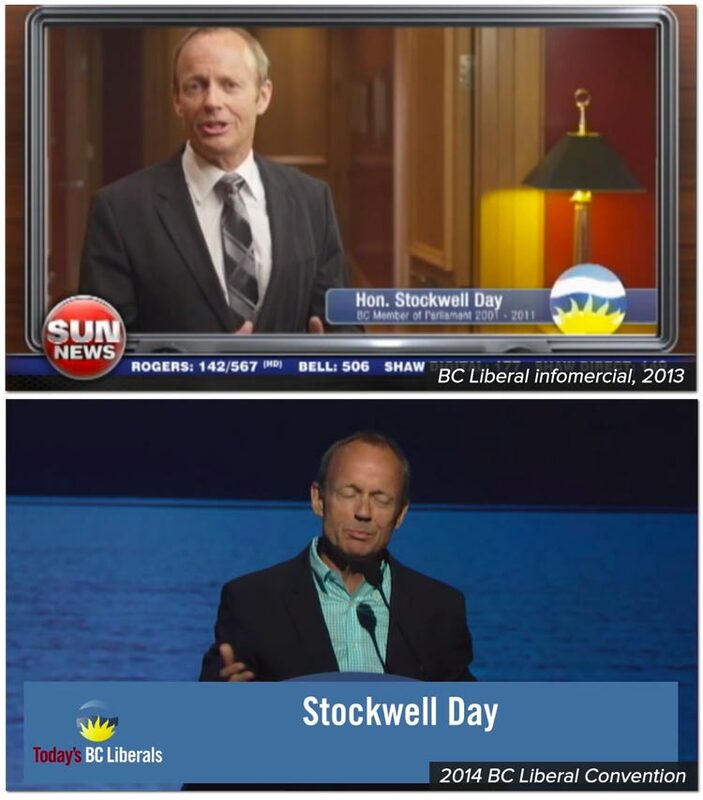 Stockwell Day succeeded Preston Manning and led the now extinct right-wing Canadian Alliance party. 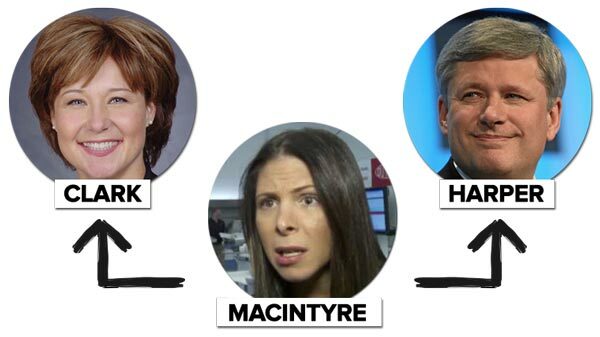 He also held three different cabinet positions in Harper’s government. 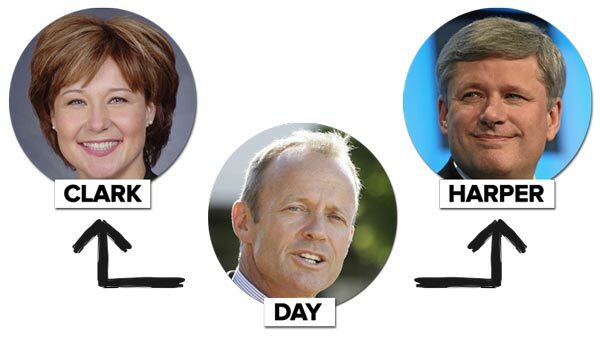 But in 2013, Day endorsed Clark during a speech at the BC Liberal convention – he even made a special cameo appearance in a 30-minute infomercial produced by the BC Liberals. 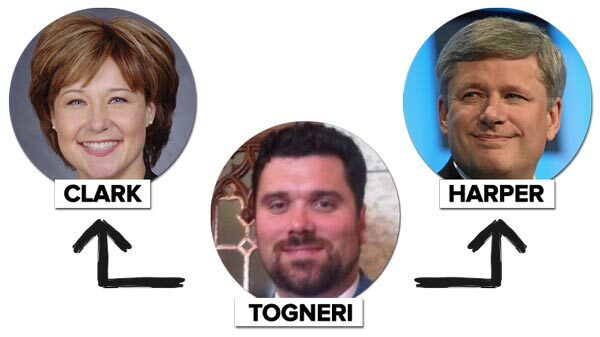 A former pollster for Harper’s Conservatives (he was also the architect of Rob Ford’s campaign to become Toronto mayor and, until recently, he was officially the manager of Kellie Leitch’s Conservative leadership campaign) Kouvalis also ran focus groups and came up with messages for Clark’s BC Liberals in 2013. 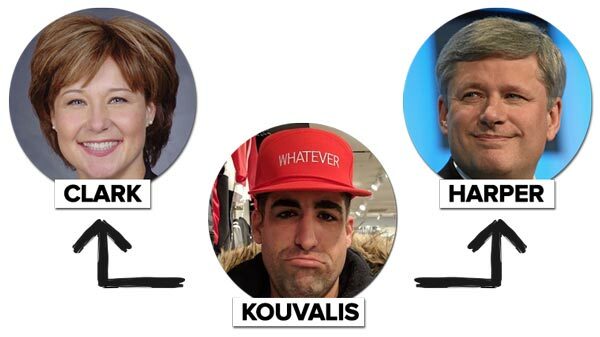 Kouvalis was lined up to work for Clark again in 2017, but after a temper tantrum on Twitter, he supposedly stepped away from the campaign. Since the early days of the Reform Party, Pantazopolous has advised everyone from Stockwell Day to Rob Ford to Stephen Harper. 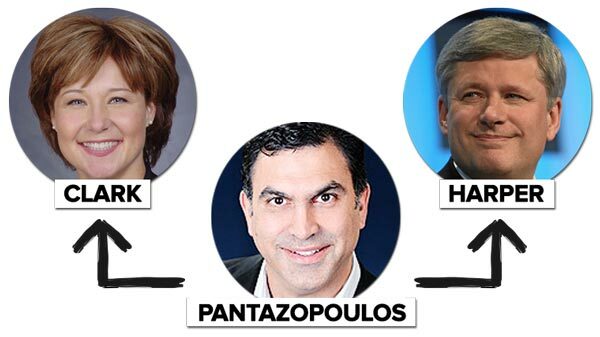 After playing a key role for Clark running voter contact during the BC Liberal’s 2013 campaign, Pantazopolous was named Principal Secretary to Premier Clark. 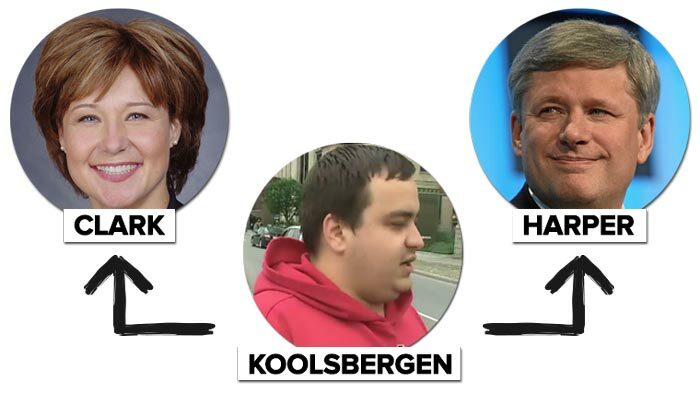 When Stephen Harper wanted to make a problem go away, Nick Koolsbergen was the staffer he turned to. Koolsbergen was the Director of Issues Management for the PMO, a job that saw him create Harper’s “enemies list” and speak with witnesses during breaks in the Mike Duffy trial, all while milling around the Ottawa court house dressed inconspicuously in a St. Louis Cardinals hoodie. 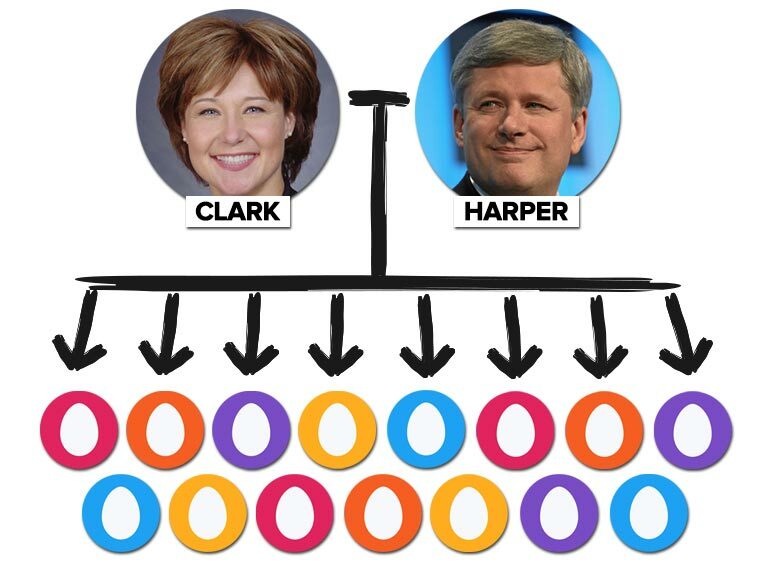 Today, Koolsbergen is on the public payroll as Clark’s Executive Director of Communications and Research. Sebastien Togneri resigned from his job as an aide to Public Works Minister Christian Paradis after the Canadian Press reported he had meddled with Access to Information requests on several occasions. Canada’s Information Commissioner later issued a report on “systemic interference” in Access to Information requests that recommended asking police to investigate. Today, Tognari is gainfully employed as the Executive Assistant to BC’s Energy Minister Bill Bennett. 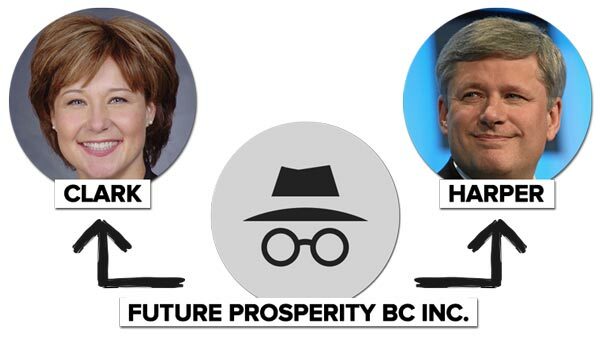 #9 Future Prosperity BC Inc.
Business interests in the natural resources and hospitality sectors are reportedly bankrolling a firm calling itself “Future Prosperity for BC” that plans to blanket BC with anti-NDP attack ads ahead of the 2017 provincial election. It turns out one of the people running this group is a former PMO staffer who was also working at Stephen Harper’s consulting firm at the same time as he was moonlighting for the shadowy group. 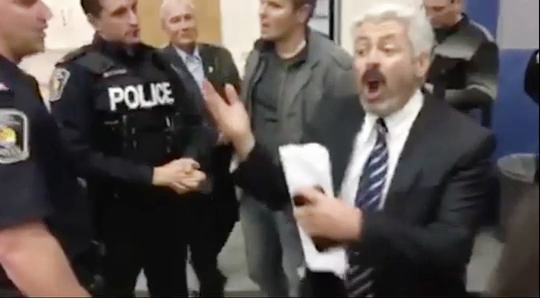 Alexander Schiff: Executive Assistant to BC Environment Minister Mary Polak, he was previously the campaign coordinator for Conservative candidate Erin Boshko in 2015. Anish Dwivedi: Communications manager for Clark’s government, but formerly a Special Advisor to Jason Kenney. Kent Verge: Chief of Staff to Minister of Jobs Shirley Bond, he used to be an advisor to a couple of Harper cabinet ministers focused on transport and the environment. Carter Mann: Operations coordinator in the Clark government, also a former Press Secretary for Revenue and Defence and Executive Assistant to Preston Manning. Zoe Keirstead: Executive Assistant to BC Agriculture Minister Norm Letnick, once a Special Advisor to Kellie Leitch. Brittany Allison: Executive Assistant to Justice Minister Suzanne Anton, formerly a policy researcher in Harper’s PMO. Nathan Clarke: Executive Assistant to BC Transport Minister Todd Stone, he was Special Assistant in Harper’s Ministry of Aboriginal Affairs a few years ago. Jessica Faddegon: Executive Assistant to Trade Minister Teresa Wat, she was the former assistant and spokesperson for Conservative MP John Weston. Vanessa Schneider: Communications Director for BC’s Minister of Community and Sport, formerly a staffer for Harper ministers Denis Lebel and Gary Lunn. Jay Denney: Chief of Staff to Trade Minister Teresa Wat, once the Communications Director for former Treasury Board President Stockwell Day. Lorne Mayencourt: Director of Research for the BC government’s caucus communications team. Once ran for the Harper Conservatives in 2008. Vivek Prabhu: Senior Communications Advisor for the BC government, previously worked in Harper’s PMO as a Communications Assistant. William Zylmans: Communications Officer for the Government of BC, formerly a Special Assistant to Peter MacKay. William Anderson: BC Government Director of Communications and Public Engagement, used to be the Executive Assistant to Natural Resources Minister Joe Oliver. That must be 24 separate coincidences, right? Former Conservative candidate Konstantin Toubis says Patrick Brown people blocked him from running for the Ontario PCs. And boy, he's not happy about it. “Welcome to the new world of dictatorship,” as Toubis puts it.